As in real life, Pins are Personal Identification Numbers. These verify that you are you and not an invader. Bank PINs are a security measure to protect your account. Bank PINs consist of a four digit code. They prevent anyone who gains access to your account from using the equipment and items you have stored in the Bank of RuneScape. It also needs to be entered before you are granted access to your Grand Exchange collection box and the Grand Exchange "Exchange Mode." Why Should I Get a PIN? You should get a PIN because it prevents you from losing equipment and resources that you have worked for. Even with the trade limit in place, you should set a PIN on your bank account. People could still sell your equipment or just put it into a Party Room drop. It's better to be safe than sorry! 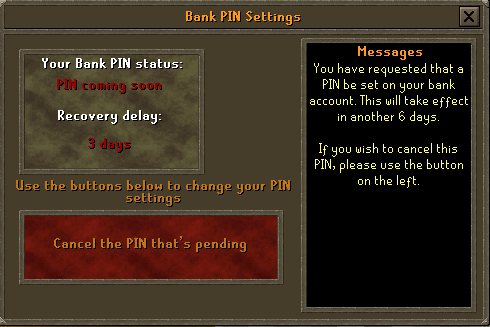 PINs can be set from any Bank of RuneScape which has a Banker working in it. This means you can not change your PIN settings from a bank chest, such as the Shantay Pass or the Lumbridge Cellar Chest. Banks can be seen from their Logo on the map, which is a dollar ($) sign. Here is an example of what a bank looks like, from the world map. The Banks are highlighted in Red. 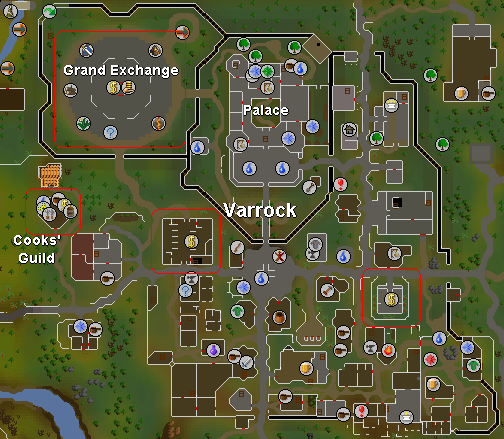 Note: The Bank in the Cooks' Guild is available only to players who have completed the Varrock Tasks. Once you have started the conversation, select the "I'd like to check my PIN settings" option. To skip the conversation altogether, you can simply select the "Bank" option in the right-click menu to access you bank as normal, and then click on the "Bank Pin" button in the bottom-left of the bank screen. 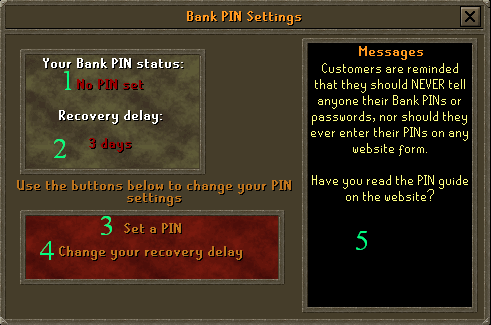 Now you will be greeted with the Bank of RuneScape PIN settings screen. Here is a description of what everything does on that page. This tells you whether you have a Bank PIN or not. This tells you how long your current recovery delay is. The recovery delay is how long you need to wait, for your PIN to be deleted, if you forget it. This proceeds to the next screen on setting your PIN, which the next section is about. This changes the recovery delay from three (3) to seven (7) days and vice-versa. This is the messages section and one of the most important sections of the screen. This updates when you change anything on the PIN settings. It will confirm when you have changed the recovery delay and what it has changed to. Once you have chosen to set your PIN, you will be greeted with a choice of proceeding or stopping the process. It makes sure you know what you are doing. Now, you will receive another screen, this time letting you choose what you would like your bank PIN to be. A famous person's Birth Year. There are a lot of these so the chances of guessing are slim. Once you have chosen your numbers, make sure to write them down and keep them in a safe place away from prying eyes. You will also need to re-enter them to make sure you have not made any mistakes. After you have done this, you will be redirected to the Bank settings page with the updated information. As you can see from this new Screenshot, my PIN status has changed to "PIN coming soon". This shows me my PIN is being processed. I also have an option to cancel the forthcoming PIN. Once you have your PIN set, the PIN settings screen will be updated to this. This will show you if you have a pin set or not. Now that you have a PIN set, whenever you wish to access your bank account, or the Grand Exchange, you will need to enter it. It can be done almost exactly how you set it, just type in the digits as they appear. However, be aware of the fact that the numbers will change places between digits and they are unlikely to be in the same spot twice running! This tells you which digit you are currently on. It will change to from the first, to the second, to the third and finally to the fourth. This is the digit entry area. Select which number comes in the correct order. For example if my PIN was 6578, I would click 6 from that screen. This is the exit option. Once clicked, it will return you to the main RuneScape playing window. This button will begin the process of canceling your set PIN. Once you click it your recovery delay will be activated. In however many days, your PIN will be cancelled. If you click this and then remember your PIN, just enter it and it will automatically cancel the cancel. This is a visual sign to which digit you are on. The Question marks (?) change to asterisks (*) once a digit has been entered. This tells you which service you are trying to use. It can either be the Bank of RuneScape, or The Grand Exchange or even The Housing Security system. You can even use your PIN to secure your Player owned house. 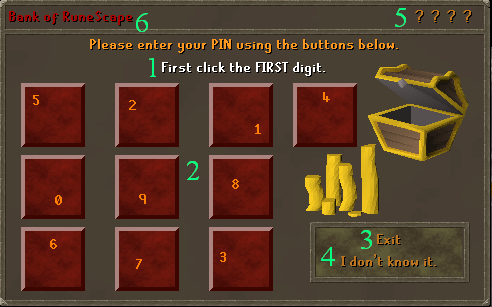 If you try to enter into your house in build mode, without having accessed the bank or Grand Exchange first, you will be forced to enter your pin into the entry screen. Never tell your PIN to anyone. 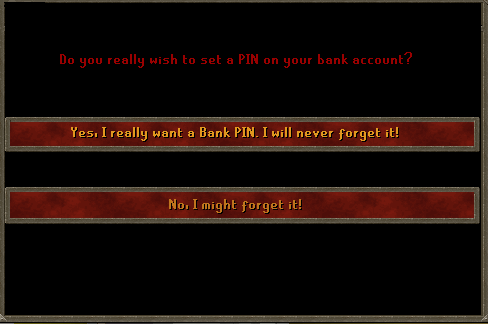 Jagex Staff members will never ask for your PIN. It is better to have a PIN, than to not. And I leave you with the old proverb, "Better to be safe, than Sorry! ".